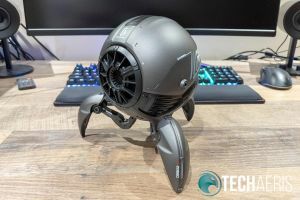 With its sci-fi inspired design, solid build quality, decent sound, and great battery life, the GravaStar Bluetooth speaker is well worth the price. Earlier this month, we reported on the GravaStar Indiegogo campaign. We’ve had one of these cool sci-fi looking speakers in our grubby little hands for a couple of weeks now. 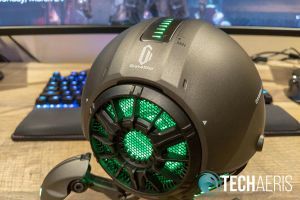 Our GravaStar review takes a look at this sci-fi inspired speaker, complete with lights and decent sound, and sees how it stacks up in the crowded Bluetooth speaker market. On that note, you can check our brief video review below or scroll past to read our full review! 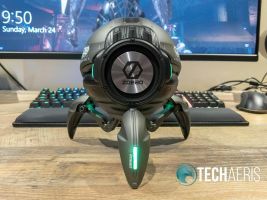 When we were asked to take a look at the GravaStar Bluetooth speaker, I expected something relatively smaller and somewhat cheap. Of course, given the number of pitches we receive, sometimes those details get glossed over when reading them. When it arrived, my first impressions included how big the box was and how heavy the box was. 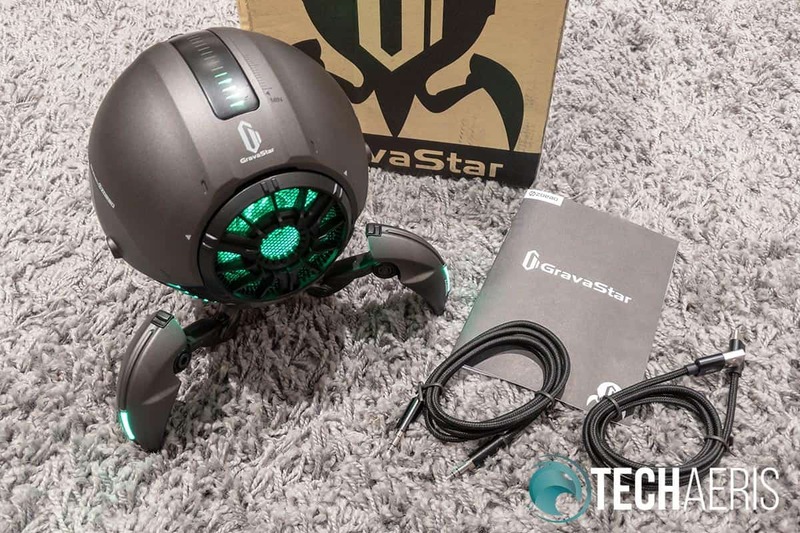 Taking the GravaStar out of the box, I was really impressed by the heft and the fact that it is constructed out of Zinc-alloy metal and plastic and not plastic alone. Not only that, this speaker is a decent size. The main ball is about 5 1/2-inches in diameter and with the legs extended it sits just under 7 1/2-inches in height and about 8-inches wide (foot to foot). 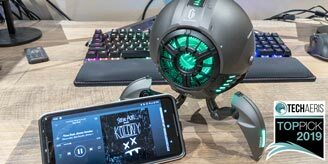 The GravaStar Bluetooth speaker is a nice size and has some weight to it. 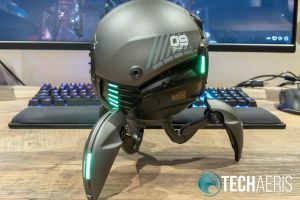 The GravaStar definitely looks like something taken out of a sci-fi movie and you shouldn’t be surprised if someone asks you what movie your latest “collectible figure” is from. 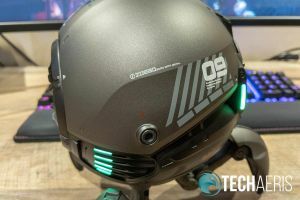 The main sphere-shaped component is grey in colour with black accents and military-style markings. The right number of bolts, divots, indents, angles, and more help complete the look. 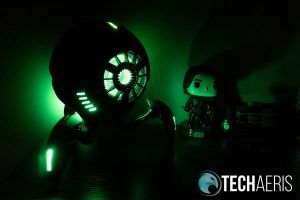 On the front side of the sphere is a black plastic grille, reminiscent of a Death Star, with a honeycomb metal grille underneath it which houses the 70mm (2.76in), 20W full-range speaker. 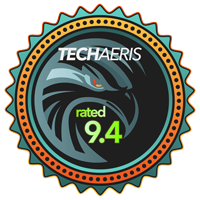 On the back side is where you’ll find the 80mm (3.15in) radiator complete with the Zoeao logo. While we’re not huge fans of big branding on devices, the Zoeao logo definitely fits the overall design scheme of the GravaStar. 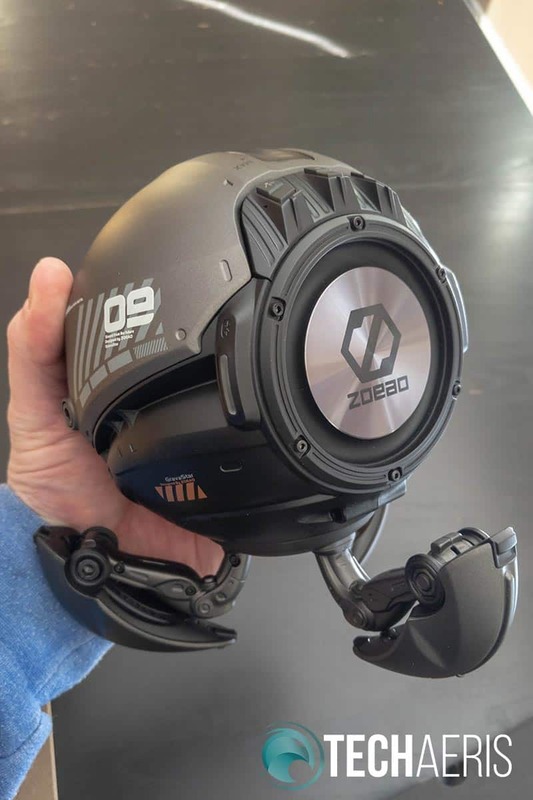 Looking at the top of the speaker, you’ll notice a black strip with vertical lines on it and the GravaStar logo and wordmark printed in white just below it. Along the right side, you’ll notice MIN and MAX markings with vertical ticks in between. The black strip is a touch control surface which allows you to easily control your volume. Located near the back of the speaker just behind this strip are three buttons. These buttons control power, playback controls, Bluetooth pairing, and LED light toggling. 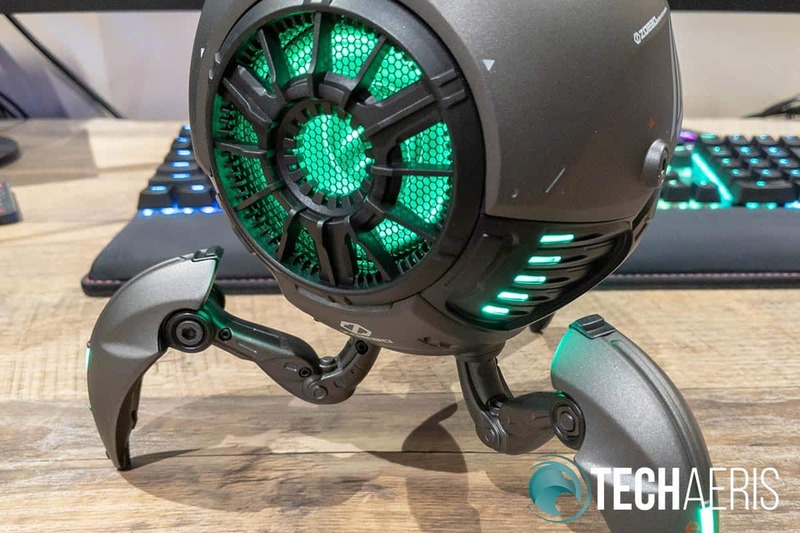 The speaker sits on three legs which can be folded in for storage. When folded out, the speaker legs support the main sphere and have tiny rubber feet on them to prevent scratching your desk. When extended, the legs not only add to the look but provide for a real solid base to the speaker. 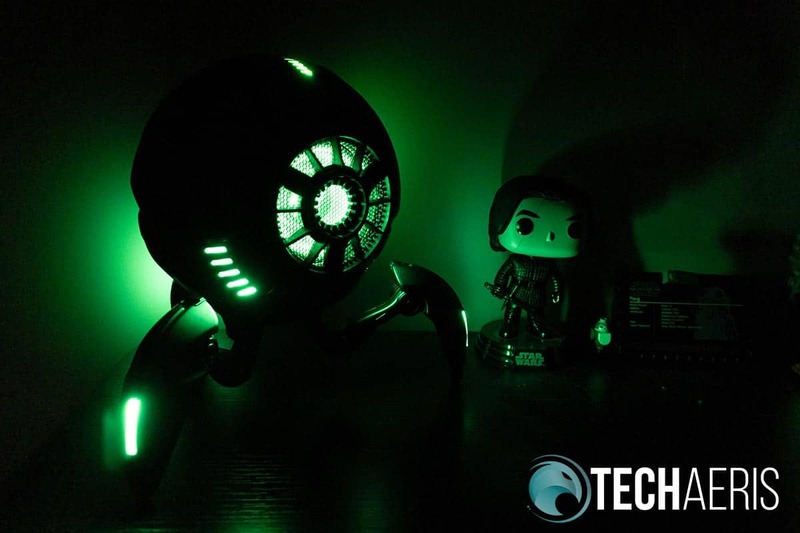 When turned on, the speaker lights up in green in various places. 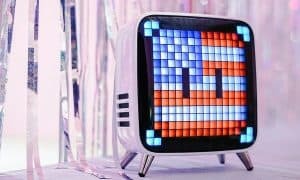 These include the main speaker grille, areas to the left and right bottom of the speaker, LED strips on the front of each of the three legs, two small power indicator lights near the back, and the volume lights. When toggled off, the two rear power indicator LEDs and the volume lights remain lit while the rest turn off. Honestly, though, the speaker is too cool with the LEDs on to use it with them off. Front view of the GravaStar Bluetooth speaker. Flipping the speaker upside down is where you’ll find your USB-C and 3.5mm AUX ports. To be honest, this is about my only complaint with the design of the speaker. You have to lift up the speaker to access either ports and second, but it does look nicer with the cables coming out of the bottom of the sphere than elsewhere. The included USB-C to USB-A and 3.5mm AUX cables are nicely braided. In addition, at 1m (3.3 feet) in length, they are long enough to provide ample slack when connected to a charger or AUX device. 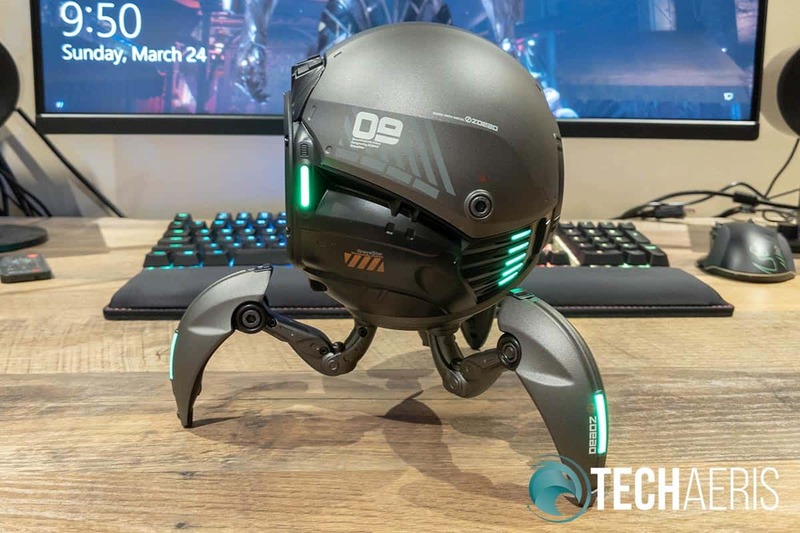 There’s really no other way to say it: this is one mean looking sci-fi robot-styled speaker. 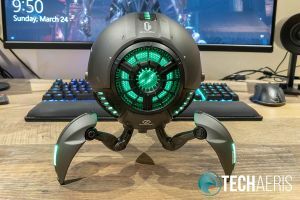 No doubt about it, it’s definitely one of the most unique looking Bluetooth speaker we’ve seen here at Techaeris in a while. 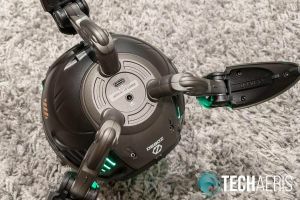 Pressing the middle power button for a couple of seconds powers it on and makes a pretty cool robotic powering up sound. To pair the speaker to your phone, press the Bluetooth button once briefly to enter pairing mode. If you press and hold it longer, you will get a beep and be ready to pair it with another GravaStar speaker and NOT your Bluetooth device, so that’s something to keep in mind. 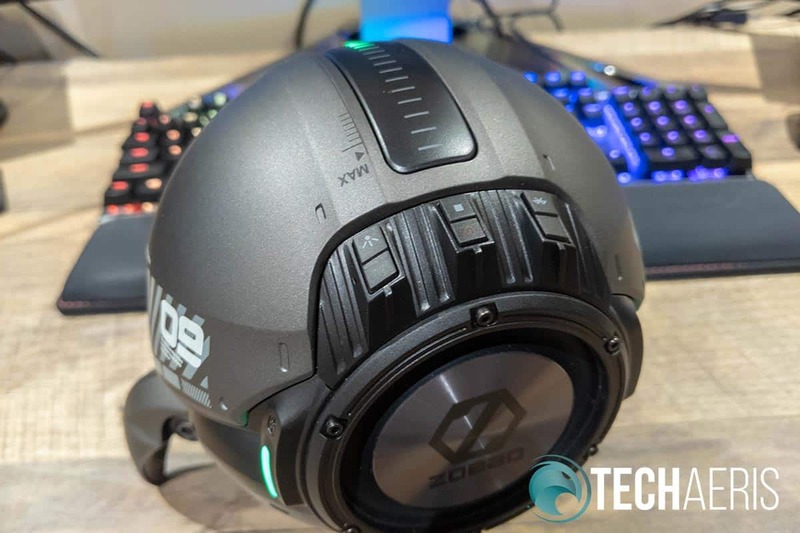 The speaker will indicate it is ready to pair after which you can locate it on your smartphone and complete the connection process. Once connected, and when turning on after you’ve already previously paired it to a smartphone, the speaker will indicate that Bluetooth is connected. Pressing the middle button will also play or pause your music, depending on the current status of your currently playing track. Pressing the far right button will toggle the lights on and off. Three buttons for power, play/pause, Bluetooth, and light toggling. To adjust the volume, simply touch the top volume touchpad to the desired volume level and your volume will be instantly adjusted. You can slide your finger up and down to adjust the volume if your in the mood to give your little robot speaker a pet. To mute the speaker, simply tap the bottom of the slider. One thing I did notice is that the volume can’t be adjusted unless you are currently playing music. When music is stopped, the volume adjustment doesn’t seem to work. It’s not the end of the world by any means but definitely something to note. Pressing and holding the power button for about three seconds will turn off the device. Like the speaker start up, you’ll get a cool sounding powering down robot sound to let you know you’re turning it off. Unfortunately, there is no way to skip to the next track or the previous track with this speaker. Likewise, there is no way to take calls with it, which we could honestly care less about, but it is something to mention for those that are in the habit of using Bluetooth speakers to take calls. Of course, as cool as a Bluetooth speaker may look, it’s pretty much a paper weight unless it has decent sound. 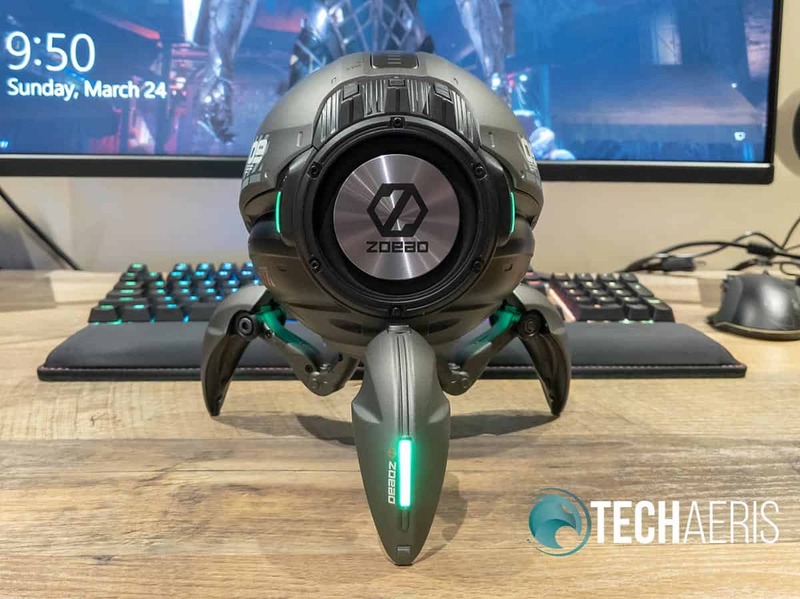 Zoeao tried a number of different shapes and designs when developing GravaStar and decided the spherical shape was the best. The sphere shape design provides the GravaStar a much clearer sound compared to other shapes we tried. Without any parallel walls or edges, the spherical shape greatly reduces any internal cabinet sound wave reflections and interference. Meanwhile, a spherical speaker allows soundwaves to transform all directions in the air so that listeners will be immersed in the sounds produced. On that note, the speaker does sound pretty great. It does get really loud, which is nice, and remains clear and crisp at maximum volume. In a bedroom, which is where most of our testing took place, we found that about 25-30% volume was more than needed for pleasurable listening. The bass is pretty punchy from a distance but closer up it does get a bit warmer. When set with the radiator facing a wall, in our opinion, is when you get the best bass out of the speaker. Still, as we prefer warmer bass it is still a bit punchier than we like but it’s definitely there. Mids and highs are fairly balanced as well, making any type of music we listened to pleasurable with this speaker. With a claimed battery life of up to 30 hours at 65% volume, our task was cut out for us with regards to battery life testing. As mentioned above, 25-30% is more than loud enough for a bedroom. On that note, with the LEDs on the entire time we streamed music to it, we ended up with 28 hours during our two tests before needing to recharge the speaker. While it’s just under the 30 hours, we did test with a lot of bass-oriented music and the LEDs on the entire time. Still, the GravaStar Bluetooth speaker has some very good battery life. On that note, given its 10,000 mAh battery, it does take a while to recharge fully. While charging, the power indicator LEDs will pulse. Once fully charged, the power indicator LEDs will turn solid. On that note, expect it to take at least 4 hours to fully recharge your robot speaker. Also of note, if you don’t already have one, you’ll need to pick up a 5V/1A USB-A power adapter to charge your GravaStar. With an MSRP of US$249.99 after the campaign ends, the GravaStar Bluetooth speaker isn’t exactly cheap. That being said, it is well built, looks cool, has great battery life, and decent sound. 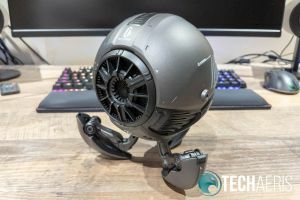 On that note, there are a few super early bird perks left at the time of this review which allow you to snag this speaker for a cool $129 — well worth the price. After that, you can snag it for $149 or $199, depending on how long you wait. As with any crowdfunding campaign, there is a risk supporting them. We’ve recently heard about several that we’ve written about that have failed or are having issues. Our reporting on Indiegogo campaigns does not mean we support or are affiliated with them. Support at your own risk. That being said, this campaign is fully funded, in the production phase, and the review unit we received is solid. If you love sci-fi, are a collector of movie memorabilia, or just plain bored of the standard Bluetooth speaker design and style, the GravaStar Bluetooth speaker deserves a spot on your shelf. With it’s sci-fi inspired design, solid build quality, decent sound, and great battery life, the GravaStar Bluetooth speaker is well worth the price, especially if you jump in on the crowdfunding early bird deals. 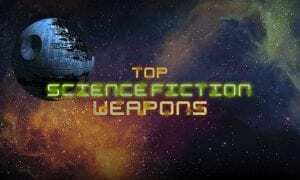 There’s no question it deserves a Top Pick of 2019 Award here at Techaeris. 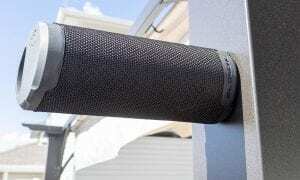 *We were sent a sample of the GravaStar Bluetooth speaker for the purposes of this review.